A collection of beds with a grand appearance with an expertly crafted wooden frame carefully wrapped in fine woven fabric. 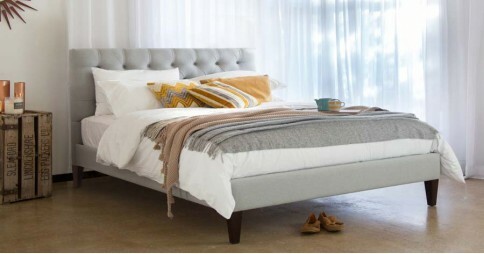 Our upholstered beds are an addition to our bed range which feature comfortable fabric headboards and bed frames. We have 6 interesting and stunning designs to choose from, each taking inspiration from what has made our wooden bed frames so popular. These high quality upholstered bed frames are luxurious and sure to add a stunning touch to any bedroom. Choosing one of these beds has many different benefits. The headboards on our upholstered beds are incredibly soft and comforting to the touch, providing a more comfortable nights sleep compared to a wooden headboard alternative. The materials have been carefully selected to provide a cotton like feel, while being made from very strong fibres. When buying your bed frame, you’re able to select the colour of the fabric of the bed so you can not only compliment your decor, but also make your bed frame personal to you. There are 7 stunning fabric colours to choose from, including such colours as sophisticated Chrome, smooth Dew and contemporary Pearl colours which have proven popular among our customers. We aim to provide a service which allows for our customers to get the enjoyment of personalising their bed.This means that as well as our range of fabric colour options, we also offer a bespoke alteration service for your bed frame. If you’d like to alter any part of the bed design or size, you can do this for as little as £55. The construction of all these upholstered frames still use mortise and tenon joints, which provides a quality and robust bed frame that lasts for years to come. So sure are we of the quality of our upholstered beds, that we offer an 11 year structural guarantee as standard across all our upholstered bed frames. 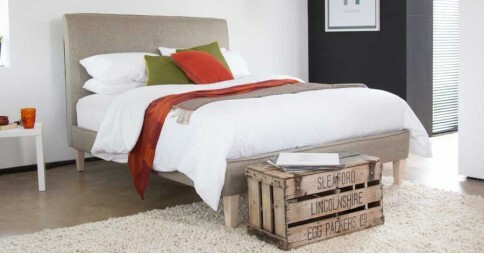 Our aim is to source the timber we use to make our beds from sustainable locations, that are both FSC and PEFC approved. 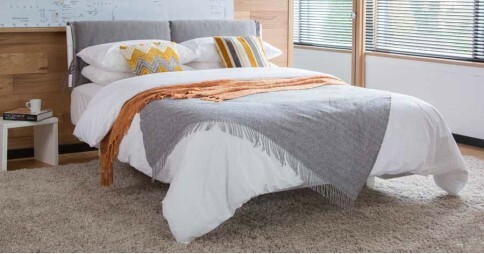 We take great pride in respecting our environmental responsibilities and we always aim for your upholstered bed to be as environmentally sourced as possible. Our mission is to provide a high quality service and while hand making your bed frame all the way up to being delivered at your door. If you have any questions, or would like to order one of our upholstered beds, please give our friendly customer service a call on 0207 183 5464.